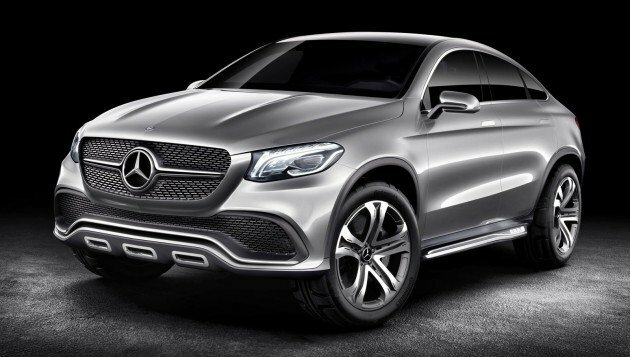 Yet another Beijing debutant has been announced, this time the Mercedes-Benz Concept Coupe SUV. With this reveal, one of the world’s worst kept secrets is out – Stuttgart is hard at work on a big coupe-like SUV to take on the BMW X6. We all know it was inevitable, but at least pretend to be surprised now, everyone. Design wise, we see a lot of the new GLA compact SUV and even the S-Class Coupe in the Mercedes Concept Coupe SUV. Following the German marque’s recent turn of form (see the earlier GLA and S-Class Coupe concepts), expect most of the styling elements you see here to make it to the production version. The upcoming production model should carry the much-rumoured MLC nameplate, and be based on the platform used by the current W166 ML-Class. Munich’s original coupe SUV (which is up for a timely update very soon) won’t be short on rivals, as Audi will soon have its own Q6 lined up too. Game on, then. Yes Mercedes are used as Taxi’s around the world because if they used BMW the passengers will never reach their destination due to the BMW Breakdown rate !! Baru Masuk Workshop = BMW ! exterior looks so close to BMW X6, but X6 still look awesome. I baru je beli sebijik untuk anak I..anak I pandai dapat 8A SPM.. I still prefer the new X6. The only mercedes good at is to copy BMW.